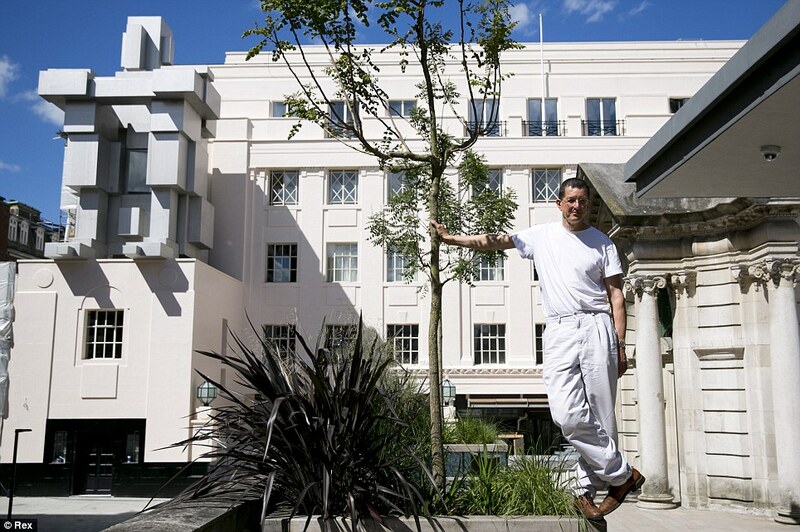 On a flight to London recently, I came across an article covering the latest work by Antony Gormley at Beaumont Hotel, Mayfair London. Having a few spare hours, I set out to have a look at the sculpture by one of my favorite artists whose works have inspired me to write these two earlier blog posts. While the basic form of the sculpture itself is similar to the one installed in Alaska, it is different in the two distinct ways. First it sits on top of a building and secondly it is a bedroom in a hotel suite! As I walked towards the hotel through a narrow alley, there it was, a crouching metallic man hugging his knees. 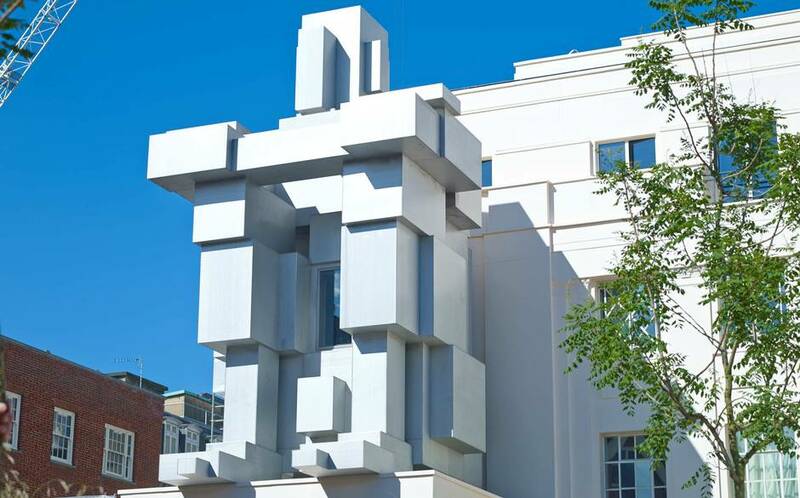 The Lego like form assembled from cube like pieces sitting on top of a jutting towards one side the building with the head reaching the top of the building. Since it was not a Berkley square or Grosvenor Square, there was not enough room to absorb the beauty of the sculpture from afar. One had to constantly crane the neck to observe the imposing figure that refuses to look back at you gazing imperiously ahead, oblivious to its surroundings. 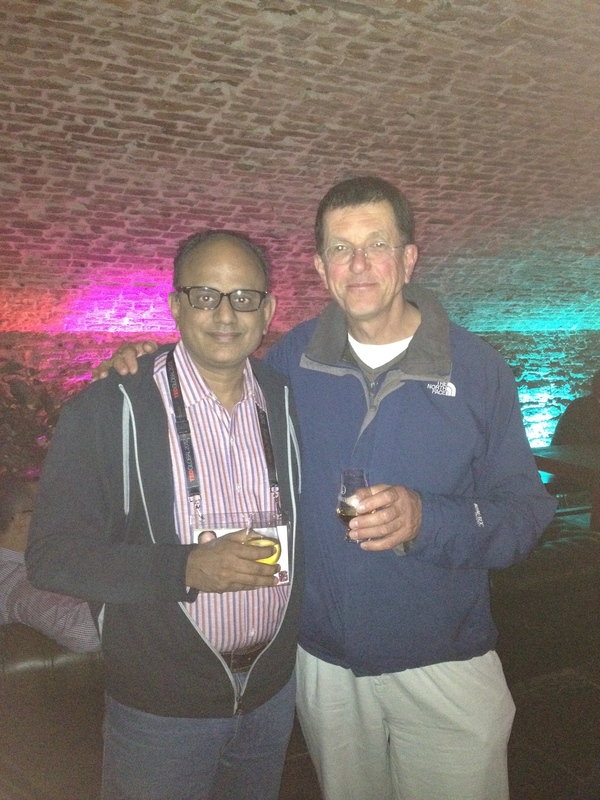 Armed with this photo of Antony and me taken in 2012, when I met him at TED Global, I thought I could charm my way into seeing the room. The Security guard was not too impressed with my request to see the owners, but did make a halfhearted attempt to go inside and look for them. After a few discussions over the radio, the head concierge walked across to me. I repeated my spiel of how I was a great fan of Antony, showed him the photo again and murmured that Antony was an acquaintance. (Couldn’t bring myself to lie that he was a friend). Also told him that I was transiting through London for only a few days and please could he just let me see the “Room” just once? Please ? The Concierge was very polite in his explanation that people are going to pay 2500 pound a night when the hotel is opened, and that it would be unfair to them if it is open for viewing for non paying visitors too! He added that since the room was a piece of art used by public, it has to be free for two days in a year as mandated by the law and suggested that I come back on 20 and 21st of September, when it would be open for public viewing.When I disappointedly told him that I won’t be able to stay back till then, he very helpfully spent time with me explaining in detail the interiors of the room. After satisfying myself and asking him all the questions that could come to my mind, I spent a little more time standing and absorbing the sheer brilliance of a contemporary genius, wishing that I could stay back to view the room on the 20th, just ten days away. From what he explained to me and subsequent research I did, I could understand that the living room and bathroom of the suite is in the hotel itself and the sculpture only houses the bed. The entrance to the sculpture is at the left side of the crouching figures bottom. One has to enter the sculpture from the white marbled bathroom (the idea is to make it easy to sleep in the buff) through a doorway that only has heavy drapes to shield the light from the bathroom. There is small flight of stairs leading a landing that only has a bed and nothing else. No furniture. Just a sparse room. The entire room including the ceiling is paneled in dark burnt wood. A small window with wooden shutters is opposite the bed. As one lies down on the bed, one can see up to the ceiling, the height of which is 33 M. Small lights have been placed around the head board of the bed and also in the strategic places in wood paneled walls and ceiling that allows you to see the interior contours of the body of the sculpture in the darkness. “I conceived of the room as “a hermit’s cave; a primal space within the city but removed from the city entirely”. An idea from the childhood? The fact that Gormley spent two years in India during his formative years and practiced Vipassana Meditation is well known. His choice of human form as his primary focus for exploring and developing his art was also was inspired by his experience of observing people lying on Railway Station platforms during his stay in India. Listen to the relevant part of his talk here. Since I cannot afford to pay 2500 pounds to spend a night and experience what Gormley wants us to, I am taking the easier option of imagining what I would reflect on, if I ever get to spend a night in the ROOM, by writing this blog . Lying on the bed, (one would hope that the mattress at least would be soft,) I would soak in the “sculpted darkness” and as I adjust my eyes to see the contours of the human form from the inside, my mind would meditate on the Panchakoshas. Unpeeling as it were the five sheaths that constitute our Gross, Subtle and Causal bodies. I am a great believer in using art to meditate upon Vedantic concepts. Through the process of enjoying the beauty of the art, I also attempt to learn Vedanta. Rupert Spira so eloquently sums up the role of art in this video. As I turn Gormley’s ROOM into a chamber of “Panchakosha”, I dare say he succeeded in leading my thoughts back into an inward journey towards its source via the five layers. After all,there is no better place than being inside a body, to discover you are not one.